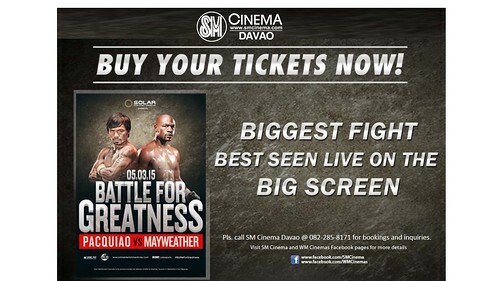 SM City Davao Cinema will be screening the most anticipated fight in boxing history on May 3. Dubbed as “The Battle for Greatness—Pacquiao Vs Mayweather”, the fight is expected to be action-packed. All 6 Cinemas of SM City Davao will screen the fight to accommodate sports fans as well as the supporters of the people’s champ, Manny Pacquiao. Manny Pacquiao is an eight-division world champion while Floyd Mayweather Jr. holds an undefeated five-division world champion title. After several issues that prevented the fight from happening, last February 20, Mayweather confirmed that the Fight of the Century has been signed. Tickets to the live streaming are available at the SM Cinema ticket booths for P700. Doors open as early as 8:00 AM on May 3. Also, May 3 is the last day of SM City Davao’s 3 Day Sale. The most exciting sale event of the season, where shoppers can avail of up to 70% off on wide selections, is scheduled on May 1 to 3 with an additional one day sale on April 30. SM Advantage, Prestige and BDO Rewards cardholders may enjoy additional discounts and perks on April 30, 9AM from SM affiliate stores. Mall hours are extended to 12 MN on May 1 and 2. For event inquiries, interested parties may call SM Davao Cinema at 285-8171 and the mall administration office at 297.6998. Like SM City Davao on Facebook or follow @SMCityDavao on Twitter and @SMDavao on Instagram for event and promo updates. LIKE our Facebook page at https://www.facebook.com/pages/Davao-Life. Follow us on Twitter at @DavaoLifedotcom.